One of the most important passages concerning the wars of the end occurs in the book of Daniel. In chapter 11 and continuing in chapter 12, Daniel discusses in detail the major prophetic events as they will occur during the reigns of the last three world powers: Persia, Greece, and Rome. The development of these prophecies within the text generally follows a chronological path. Chapter 11 begins by tracing the future through the empires of Persia and Greece, and then concentrates on two of the four kingdoms which came after Alexander’s death. These two Greek powers are looked at in fine detail, because their predicted affects were significant on the Jewish people still living in the land of Israel. 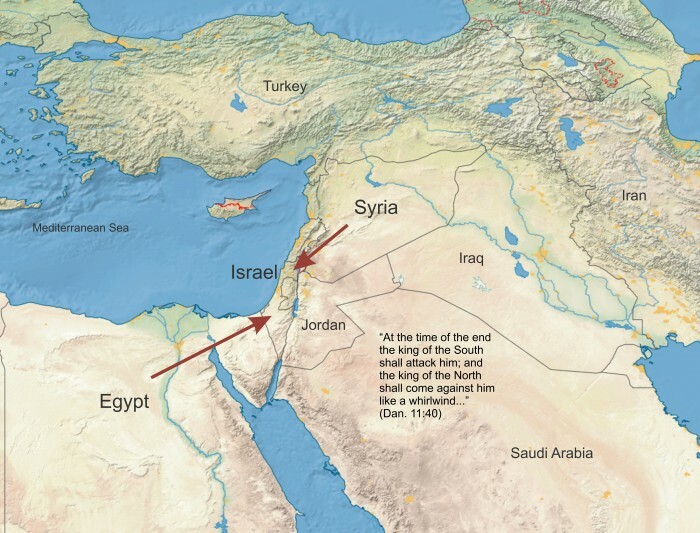 Seeing that the “king of the south” Daniel referred to throughout chapter 11 was Egypt and the “king of the north” was Syria, it appears that World War III will have its start in a Middle East revolt against the Antichrist. This is not surprising to anyone living in our generation. The powder-keg brewing around the Arab-Israeli conflict (not to mention the many Arab-Arab wars and the constant threat of Islamic terrorism) certainly has the potential of developing into a world war at any time. When the Antichrist declares himself God, the Muslim nations will be among the first to react. Daniel describes the final scenario as involving an initial attack from the nation of Egypt that will be quickly followed by a massive assault from Syria. And where will this attack be directed?—toward the nation of Israel, of course!